"Chinese 5-spice powder has a proven track record of awesomeness when combined with smoky, caramelized meats. 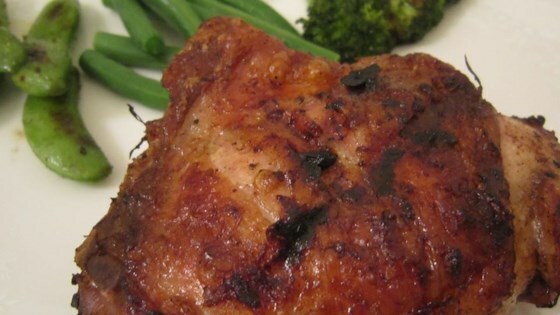 This grilled five spice chicken recipe is a great example." Score the skin side of each piece of chicken 2 to 3 times, about 1/8 inch deep. Whisk together the the juice of 1/2 lime, 1 tablespoon fish sauce, garlic, 1 tablespoon rice vinegar, Chinese five-spice powder, 2 teaspoons hot chile paste, ginger, and soy sauce in a bowl. Pour into a resealable plastic bag. Add chicken, coat evenly with the marinade, squeeze out excess air, and seal the bag. Marinate in refrigerator for 6 hours. Remove chicken halves from the bag and transfer to a plate or baking sheet lined with paper towels. Pat chicken pieces dry with more paper towels. Reserve marinade mixture in a small bowl. Whisk together the 1/3 cup rice vinegar, juice of 1/2 lime, 1 teaspoon fish sauce, and 1 teaspoon hot chile paste in a small bowl. Set aside. Grill chicken, skin-side down, on the preheated grill for 2 minutes. Turn each piece, brush with reserved marinade mixture, and move to indirect heat. Grill, brushing with glaze and turning ever 10-15 minutes, until well-browned and meat is no longer pink in the center, about 45 minutes total. An instant-read thermometer inserted into the thickest part of the thigh, near the bone, should read 180 degrees F (82 degrees C). Drizzle vinegar lime juice mixture over the chicken and serve. Honestly this tasted pretty good but it was not worth the amount of prep time required in my opinion. delicious! used bone in chicken breasts. came out nice and juicy and wonderfully spiced on the grill. thanks for the post Chef John! This was awesome! I used chicken breast and I can only imagine what it would taste like with a whole chicken.